At 7.29pm on Thursday night, Shaun Brisley was wondering whether he would be needed by Peterborough United in their clash at Oldham Athletic this weekend. One phone call and a few seconds later, the central defender had agreed to sign on loan for Posh’s rivals Northampton Town and was looking forward to a Sixfields date with Oxford United on Saturday. Brisley’s loan switch to the Cobblers is a move that came out of the blue for the player, but the 25-year-old didn’t need a second invitation. “It all happened very quickly,” revealed Brisley. “I only found out about 7.30pm on Thursday, so I jumped at the opportunity to come out and get some games. Brisley met his new team-mates and trained with them on Friday morning, and is likely to start in the centre of defence against unbeaten Oxford on Saturday (ko 3pm). “It is a quick turnaround,” said Brisley, who began his career at Macclesfield, making his debut as a 16-year-old alongside his new Town centre-back partner Ryan Cresswell. “I was training with Peterborough on Thursday, and then I am travelling on Friday morning and training with Northampton. “But it is a nice game to start off with, against Oxford. Brisley has been with Peterborough since 2012, with the highlight of his Posh career to date being when he scored the second goal in the 3-1 Johnstone’s Paints Trophy Final win against Chesterfield at Wembley in 2014. But he has found himself sidelined a little since the turn of the year, and has made only one league start for the London Road club since February. 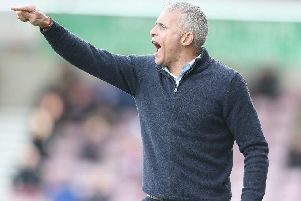 Peterborough is not a happy camp at the moment, with manager Dave Robertson being sacked last weekend, and Brisley is happy to get away and concentrate on his own game. “It has been a difficult start to the season at Peterborough, which we’re not used to as the past couple of years we have always started well,” said Brisley. “So I think the change in manager was made because of that start, and there is no news yet on any new manager coming in. And what are the strengths and weknesses of the Cobblers’ new loan signing. “I like to think I am good on the ball,” said Brisley, who is set to replace Rod McDonald at the heart of the Cobblers defence on Saturday. “I made my debut in league two, so I know it’s a bit more rough, but I have that side to my game as well.